In the early 1970s, Britain was about to join the EEC and New Zealand's dairy industry was desperate for new markets and new products. They were found, partly thanks to a group of talented young technologists, scientists and marketers, a multi-national beverage company and a transformational new technology called ultrafiltration. At the time, casein products were seen as an important part of the diversification push, But there was a problem: how to deal with the potentially polluting whey byproduct from large new casein plants? One answer came through ultrafiltration, a technique that enabled the production of whey protein concentrates. They could be tailored as specialised food ingredients and were so valuable that processing highly dilute whey became profitable. These concentrates, along with other whey products, are now an established industry and almost no whey is wasted. It is New Zealand's biggest waste to riches story. Whey to Go is the story of the early decades of development, written by several of the pioneers: Ken Kirkpatrick, Kevin Marshall, Dave Woodhams, Mike Matthews, Peter Hobman, Lee Huffman, Jim Harper, Robin Fenwick, Arthur Wilson. • A rare book, an autobiography of an industry. • It spans the people, the business, the process technology and the food science; the ups and downs. • ...allows room for the technical detail for those who want it. seeking something more to take pride in. • ...by no means a standard textbook, but it is a thoroughly good read and holds many more pertinent lessons than most conventional publications. 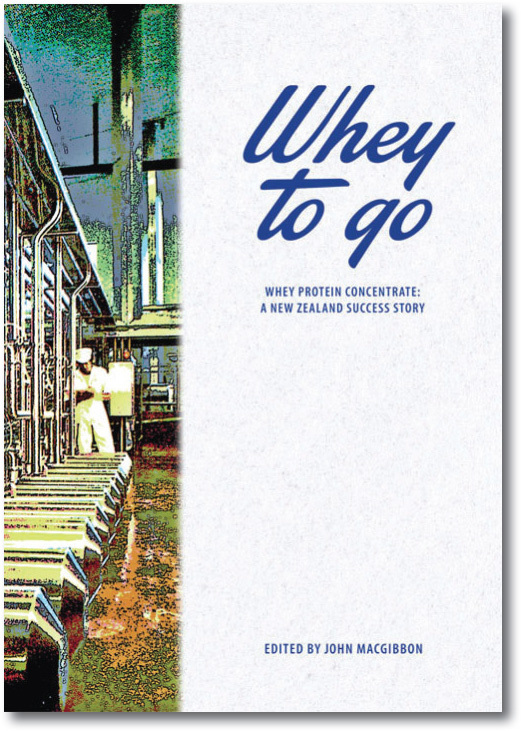 • This book manages to inform on the dairy science and technology of whey protein concentrate development at the same time as bringing out many of the human stories of creativity, imagination, determination and persistence that were needed for the project to succeed as it did. • The particular set of circumstances of the geopolitical changes, government backing, the structure of the industry, together with the assembly of such a talented and determined bunch of people basically elevated NZ on the other side of the world head and shoulders above the powerhouses of Europe and the USA. A fascinating story about how industrial innovation really works in practice. It takes time, it's often not linear, it takes collaboration across disciplines and across organisations, but most of all, it works because of the confidence, imagination, passion and perseverance of individuals. The New Zealand dairy industry has grown to global leadership through a number of technologically based phases of innovation. Whey to Go describes one of the most important of them.